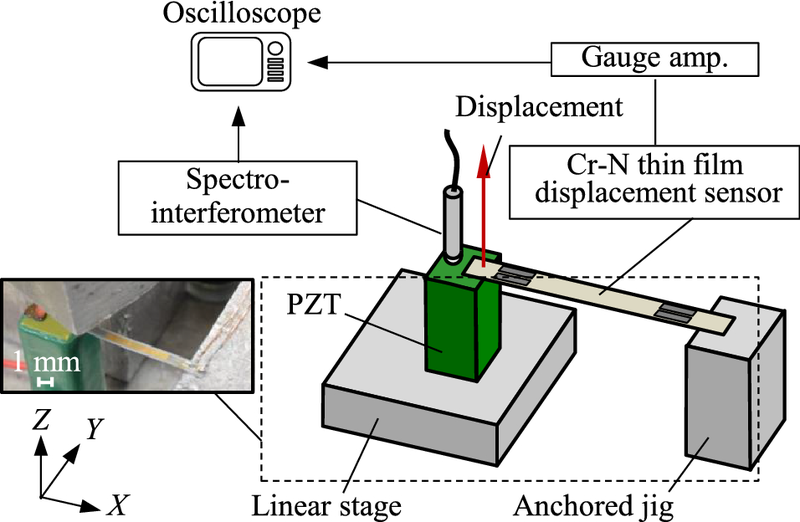 In this paper, an attempt is made to integrate a compact strain gauge-type displacement sensor referred to as the Cr–N thin-film displacement sensor into the XY micro-stage designed in a small size of 25 mm (X) × 25 mm (Y) × 6.5 mm (Z) to achieve closed-loop nano-positioning of the stage. 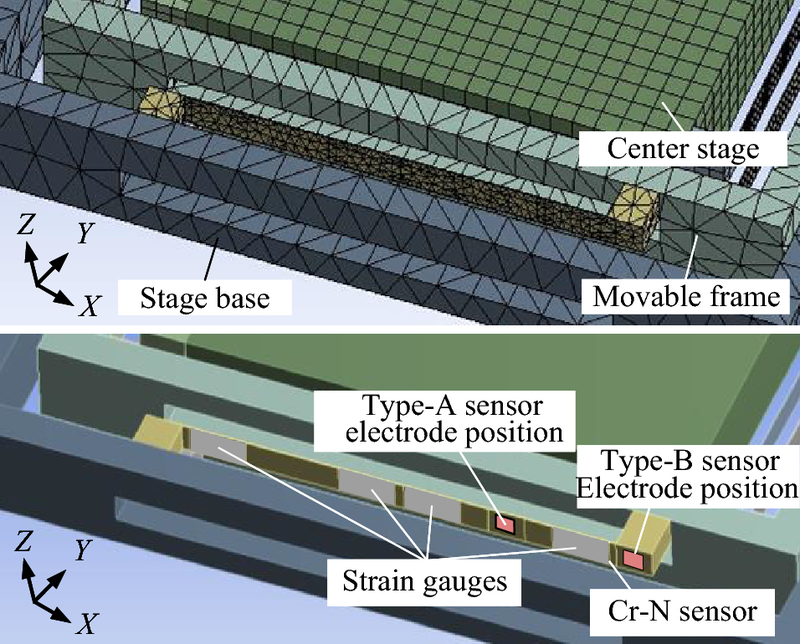 In the XY micro-stage, which has been developed in the previous study by the authors, Cr–N strain gauges for the Cr–N thin-film displacement sensors are directly fabricated on elastic hinges integrated into the stage structure so that the elastic hinges can be employed as sensors for stage positioning as well as guides for a stage table. In this paper, two types of the Cr–N thin-film displacement sensor having different layouts of the strain gauges, line patterns and land patterns are designed and fabricated. Computer simulation based on the finite element method is also carried out to evaluate the robustness of sensors against the external disturbances from electrical wires soldered onto a sensor surface. After some basic experiments, each of the developed Cr–N thin-film displacement sensors is integrated into the XY micro-stage, and its feasibility is evaluated in experiments. Nano-positioning is one of the key technologies required not only in state-of-the-art scientific instruments but also in measuring instruments and machine tools in production engineering [1, 2, 3]. With the enhancement of precision positioning sensors such as linear/planar encoders [4, 5, 6, 7] or laser interferometers , highly precise positioning can be carried out in many kinds of positioning systems [9, 10]. Among the positioning systems, recently, micro-stages designed in a compact size are of great importance especially in industrial fields such as micro-optics , biology  and precision measurement . In these applications, a micro-stage is required to satisfy multi-axis motion, a compact size of several cubic centimeters, a millimetric wide travel range and a nanometric positioning resolution simultaneously. Many efforts have therefore been made so far to design positioning systems in a compact size. With the employment of piezoelectric (PZT) actuators combined with hinge mechanisms [14, 15, 16] or driving mechanisms [17, 18, 19], some of the positioning systems have achieved a long travel range and a high positioning resolution simultaneously, while packing all the stage structures in a compact size. The author’s group has also developed the XY micro-stage  designed in a compact size of 24 mm (X) × 24 mm (Y) × 5 mm (Z) that has achieved a long travel range of 1 mm in both the X- and Y-directions based on the friction drive mechanism with a unique driving unit composed of a permanent magnet and a pair of PZT actuators. For such micro-stage systems, compact displacement sensors capable of being integrated into the stage structure are necessary to carry out closed-loop nano-positioning. In most of the cases, capacitive-type displacement sensors are employed in micro-stage systems due to their high resolutions . However, on the other hand, it is difficult to design a capacitive-type displacement sensor in a compact size while achieving a high resolution, which prevents a micro-stage system to be designed in a compact size. Meanwhile, a strain gauge-type displacement sensor, which is designed in a compact size and is easy to be integrated into a limited space, is a candidate for displacement measurement in a micro-stage system. Meanwhile, low resolutions of conventional strain gauge-type displacement sensors with Cu–Ni- or Si-based strain gauges have prevented the employment of conventional strain gauge sensors from being applied to micro-stage systems. In responding to the background described above, a highly sensitive thin-film displacement sensor based on Cr–N thin-film strain gauges (referred to as the Cr–N sensor in the following) has been developed [22, 23, 24]. Since the Cr–N thin film, which is made of chromium with a small quantity of nitrogen deposited by reactive sputtering in a RF magnetron sputtering device , has a much higher gauge factor compared with the conventional Cu–Ni-based strain gauges as well as much lower temperature coefficient of resistance (TCR) compared with the conventional Si-based strain gauges, a highly sensitive and stable displacement measurement can be expected to be realized by the Cr–N sensor. 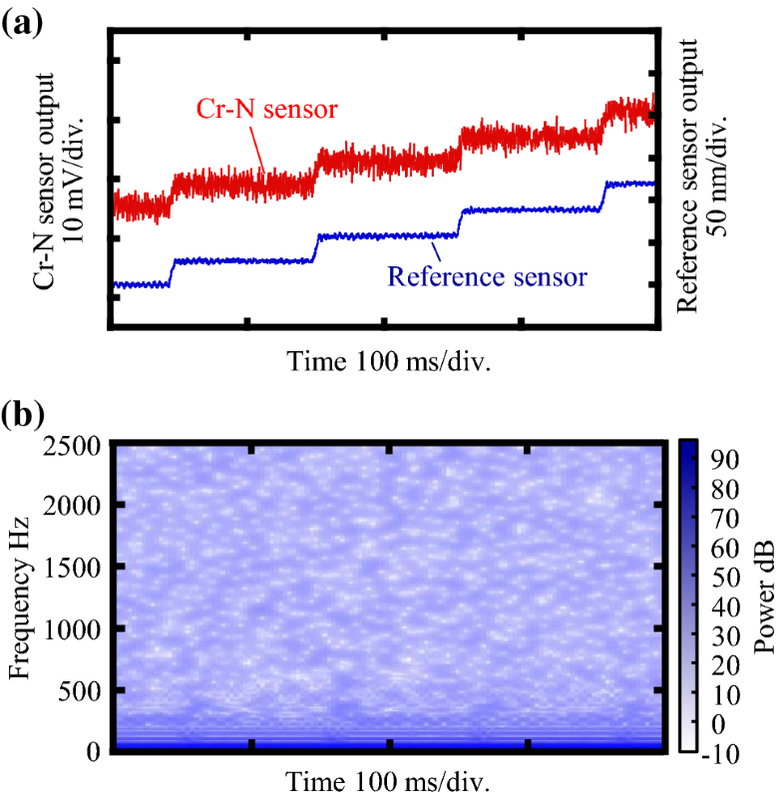 The results of basic experiments have revealed that the developed Cr–N sensor has a possibility of achieving a nanometric resolution for displacement measurement . 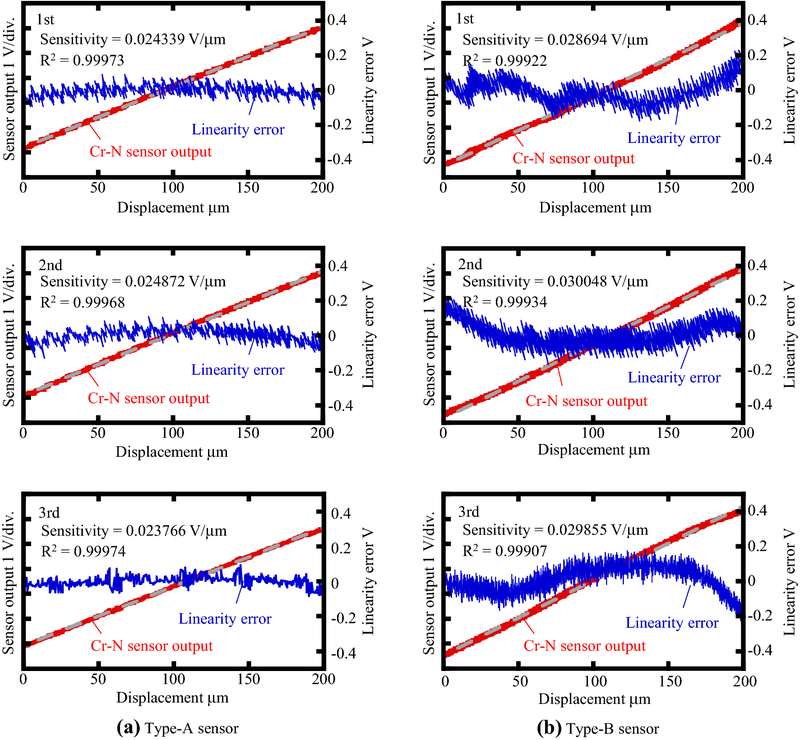 Meanwhile, performance verification of the developed Cr–N thin-film displacement sensor in the XY micro-stage has remained as a challenge to be addressed. In this paper, for the verification of the achievable positioning resolution by the XY micro-stage with the Cr–N sensors, an integration of the developed Cr–N sensor into the XY micro-stage is carried out as the next step of research. Two types of the Cr–N sensor are prepared, and their basic performances in the XY micro-stage are investigated in experiments. Figure 1 shows a schematic of the XY micro-stage , in which the Cr–N sensors are employed as displacement sensors. Figure 1a, b shows an exploded perspective view and a completion view of the XY micro-stage, respectively. The XY micro-stage is composed of a fixed base, a fixed frame, four pairs of elastic hinges, a movable frame, a center stage and a driving unit. 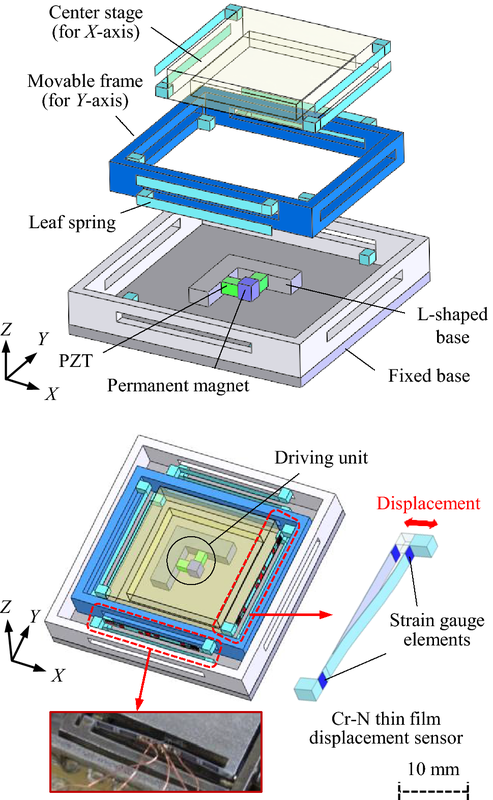 The driving unit, which is rigidly fixed on the fixed base, is composed of an L-shaped base, a permanent magnet and a pair of piezoelectric (PZT) actuators. The permanent magnet, which is connected to the L-shaped base via the pair of PZT actuators as shown in the figures, is employed not only to hold the center stage but also to move the center stage based on the principle of friction drive . Since the pair of PZT actuators are arranged at right angle in the driving unit, the center stage can be moved along both the X- and Y-directions simultaneously. The center stage is connected to the movable frame via the two pairs of elastic hinges so as to be driven along the X-direction within the movable frame. It should be noted that the elastic hinges work as the supports and guideways, which restrict the motion of the center stage along the Y- and Z-directions. In the same manner, the movable frame is connected to the fixed frame via two more pairs of elastic hinges so as to be driven along the Y-direction within the fixed frame, which is rigidly fixed on the fixed base. The XY micro-stage is designed to have a compact size of 24 mm × 24 mm × 5 mm, while achieving a long travel range of 1 mm along both the X- and Y-directions . With the direct fabrication of Cr–N thin-film strain gauges on the elastic hinges , measurement of the center stage displacements along the X- and Y-directions in the stage system can be realized, while allowing the whole stage system to be designed in a compact size. In these equations, Rα, ΔRα and εα (α = 1, 2, 3, 4) are electrical resistances, the changes in electrical resistances and strains of the strain gauges, respectively, E is a voltage applied to the bridge circuit, k is a gauge factor of the strain gauges, and K is a parameter including the gauge factor and the amplification rate of the strain gauge amplifier. As can be seen in the equations, Δd can be obtained by detecting ΔV once the parameter K is calibrated by using a reference displacement sensor. Table 1 summarizes the specifications of Cr–N sensors designed in this paper. Basic performances of the developed Cr–N sensors were evaluated in experiments. Figure 3 shows the experimental setup developed for evaluation of the linearity of sensor output. In the setup, one end of a sensor was fixed to the tip of the PZT actuator mounted on a manual stage, while the other was fixed on a jig. The Z-directional displacement can be applied to the Cr–N sensor by using the PZT actuator. A commercial spectro-interferometer (Keyence LC-2400) was employed to measure the Z-directional displacement of the edge of a Cr–N sensor. A sensor was connected to the strain gauge amplifier (Kyowa CDV-700A), and the voltage output from the amplifier was monitored by an oscilloscope, as well as the output signal from the reference spectro-interferometer. The uncertainty of the spectro-interferometer was considered to be 280 nm (k = 2), where k is the coverage factor. At first, sensitivity and linearity of the developed sensors were evaluated, where sensitivity of sensors is the ratio of an output voltage of the sensor to an applied displacement of the stage. By using the manual Z-stage, the Z-directional displacement was applied to one end of a sensor, while the other end was held stationary. Figure 4a, b shows the results obtained by using Type-A and Type-B sensors, respectively. In this case, sensitivities of Type-A and Type-B sensors were evaluated to be approximately 24 mV/μm and 29 mV/μm, respectively. For practical use, sensitivity of the sensor depended on the slight difference of setting. Therefore, we have to calibrate the sensor for each setting. The obtained sensitivities were comparable with each other since the design parameters of both the sensors were quite similar with each other as shown in Table 1. Resolutions of the developed Cr–N sensors were also compared in experiments by using the same setup shown in Fig. 3. In the experiments, the Z-directional translational motion in a step of several tens of nanometers was applied to one end of a Cr–N sensor by using the PZT actuator, while the other end was held stationary. Figure 5a, b shows the voltage outputs from Type-A and Type-B sensors, respectively. In the figure, low-pass filtered voltage outputs from the sensors with a cutoff frequency of 100 Hz were also plotted. Although the sensitivity of Type-A sensor was higher than that of Type-B sensor in the previous experiment, Type-A sensor was found to have a resolution of 90 nm, which was lower than that of Type-B sensor (22 nm); this was mainly due to high-frequency components in the voltage output from Type-A sensor. Here, resolution of the sensor is defined as 2σ of sensor output divided by sensitivity when the voltage applied in the PZT was constant, where σ is the standard deviation of the output voltage. One of the possible root causes of this result is external disturbances via the electrical wires soldered onto the land patterns in the Cr–N sensor. To evaluate the influence of wires soldered onto Cr–N sensors, computer simulation based on a finite element method (FEM) is carried out. Figure 6 shows the finite element model of the Cr–N sensor employed in the simulation. In the model, one end of the sensor is connected to the fixed center stage, while the other is connected to the fixed movable frame. At first, a normal load of 0.1 mN is applied to the surface area with a size of 0.5 mm × 0.5 mm, which corresponds to the size of a land pattern located in the developed Cr–N sensor. Figure 7a shows the von Mises strain estimated at each of the strain gauges in Type-A sensor. As can be seen in the figure, the applied normal load is found to generate a certain amount of strain on each of the strain gauges; this result means that the external disturbances from the wire bonded to the electrode could affect the voltage output from the Type-A sensor. Next, for the simulation of Type-B sensor, the position of the land pattern is moved from the original position to the edge of elastic hinge, and the simulation is carried out again in the same manner as described above. Figure 7b shows the estimated von Mises strain in the case of Type-B sensor. As can be seen in the figure, the von Mises strain generated on each of the strain gauges is dramatically reduced. This is considered that the strain for Type-B sensor is smaller since the force via wires at the fixed ends does not cause the deflection of sensors theoretically. Therefore, it is concluded that the wires should be soldered at the fixed ends. Regarding the experimental results and simulation results, it can be concluded that the land patterns on a Cr–N sensor are preferred to be placed around the edges of an elastic hinge to reduce the influences of external disturbances via the soldered wires, while sacrificing sensor sensitivity. Each of the developed Cr–N sensors was integrated into the XY micro-stage to demonstrate its feasibility as a displacement sensor for closed-loop nano-positioning. Figure 8a shows a photograph of the developed experimental setup, and Fig. 8b shows its diagram. Each of the developed Cr–N sensors was integrated into the XY micro-stage and was placed between the center stage and the movable frame to measure the X-directional displacement of the center stage. In the setup, voltage output from a Cr–N sensor through the strain gauge amplifier was captured by an oscilloscope, as well as a voltage output from a commercial fiber optic displacement sensor (MTI Instruments MTI-2100) employed as a reference. The uncertainty of the fiber optic displacement sensor was considered to be 5.4 nm (k = 2). As a measurement target for the commercial displacement sensor, a cube beam splitter sputtered with gold was placed on the center stage. Actually, the rotational displacement of the optical prism on the stage about the Y-axis due to translational displacement of the stage can cause the Abbe error in the measurement. However, the travel range for the evaluation of the resolution was approximately 25 nm, and the rotation about the Y-axis was ignored in this short travel range at this stage. The uncertainty of cosine error due to tilting about the Z-axis was considered to be 0.09 nm for the displacement of 1 μm. At first, stability of voltage output from each of the sensor was evaluated in experiments. Output waveform from each of the sensors was observed during a period of 60 s with a sampling rate of 200 Hz. Figures 9a, b shows the voltage outputs from Type-A and Type-B sensors, respectively, observed in time domain. A 3σ value of the voltage output from Type-A sensor was evaluated to be approximately 31.6 mV. As can be seen in Fig. 9a, low-frequency fluctuation was found in the voltage output from Type-A sensor, which was mainly due to the external disturbances from the wires soldered to the Cr–N sensor. Meanwhile, as can be seen in Fig. 9b, the low-frequency fluctuation was effectively reduced in Type-B sensor. Figure 10 shows voltage outputs from the sensors in frequency domain. As can be seen in the figure, it was revealed that frequency components lower than 100 Hz were dominating factors that affected the voltage output from Type-A sensor, while the low-frequency components were reduced in the voltage output from Type-B sensor. These results demonstrated the advantages of Type-B sensor for improving the signal quality of the sensor output. It should be noted that a small peak at a frequency of 628 Hz in the sensor output was due to the natural frequency of the Cr–N sensor. 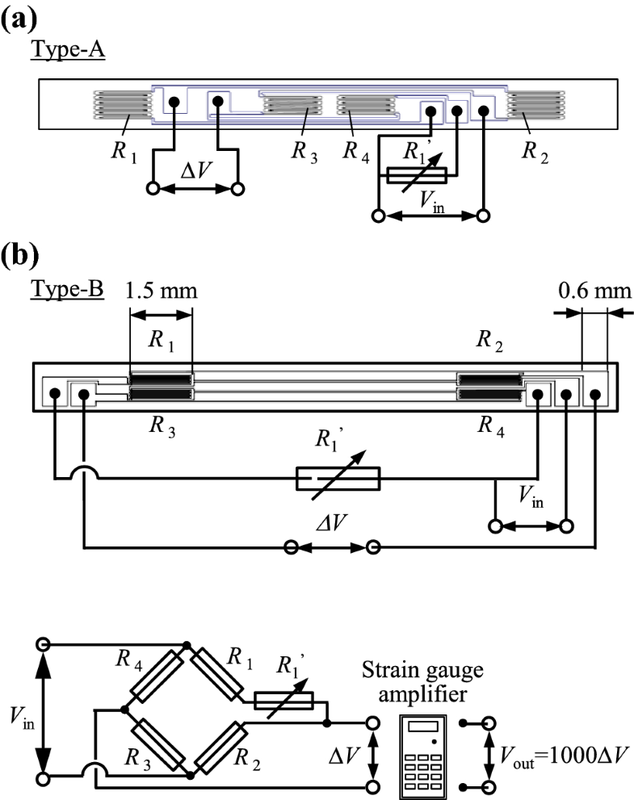 Experiments were extended to evaluate the resolution of Type-B sensors integrated into the stage system by using the same experimental setup described shown in Fig. 8. The center stage was moved along the X-direction in a step of 30 nm by using the driving unit in the XY micro-stage, and the stage displacement was observed by a Cr–N sensor. 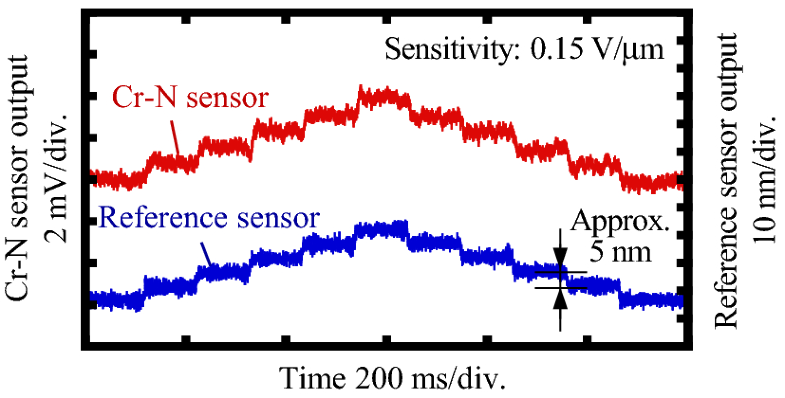 Stage displacement was also measured by the reference displacement sensor. Figure 11a, b shows the voltage output from the Type-B sensor observed in time domain and frequency domain, respectively. In Fig. 11a, output from the commercial displacement sensor is also plotted for comparison. Noticeable oscillation due to the step motion of the stage was not observed in the sensor output in both time and frequency domains, as can been seen in Fig. 11a, b, respectively. To further investigate the resolution of Type-B sensor, the stage was moved in a step of 5 nm. Figure 12 shows the sensor output obtained in the experiment. It should be noted that a cutoff frequency of the signal conditioner for the bridge circuit, in which Type-B sensor was integrated, was set to be 100 Hz in this experiment. The stage displacement in a step of 5 nm could clearly be distinguished from the Cr–N sensor output. These results demonstrated that the Type-B sensor had a high resolution of 5 nm when integrated into the XY micro-stage, while achieving a high robustness against the external disturbances via the lines soldered to the sensor surface. 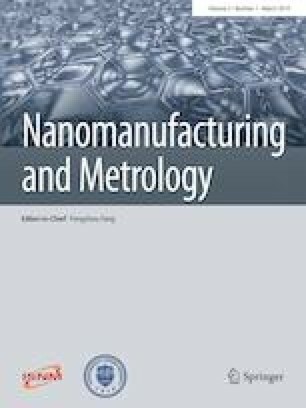 It should be noted that, as the second step of research following the development of mechanical structures for the XY micro-stage, this paper has focused on the integration of Cr–N sensor into the XY micro-stage. Further detailed investigation for a closed-loop control of the stage system as well as the evaluation of dynamic characteristics of the developed sensor is the next step of research and will be carried out in future work. Aiming to achieve the closed-loop nano-positioning control of the XY micro-stage having a travel range of 1 mm , an attempt has been made to integrate a Cr–N thin-film displacement sensor (Cr–N sensor) into the stage. Two types of electrical layout design have been prepared for the Cr–N sensor, and the performances of fabricated Cr–N sensors have been compared in experiments. In addition, computer simulation based on the finite element method (FEM) has also been carried out to evaluate the robustness of sensors against the external disturbances from electric wires soldered onto a sensor surface. The results of basic experiments before the sensor integration and the simulation have revealed that the signal quality of the sensor output has degraded due to the external disturbances in the case where land patterns being placed among the strain gauges on an elastic hinge surface in the Cr–N sensor. Each of the designed Cr–N sensors has been integrated into the XY micro-stage, and some experiments have been carried out to evaluate the performances of sensor in the stage system. Experimental results have demonstrated that the sensor having land patterns at the edges of elastic hinges can achieve a resolution of 5 nm for displacement measurement of the XY micro-stage. It should be noted that an effort has been made in this paper focusing on the integration of Cr–N sensor into the XY micro-stage as the second step of research following the development of mechanical structures of the XY micro-stage. Further detailed investigation for a closed-loop control of the stage system as well as the evaluation of dynamic characteristics of the developed sensor will be carried out in future work. This work was supported by Japan Society for the Promotion of Science (JSPS) and the NSK Foundation’s Research Grant for Advancement of Mechatronics (2016–2017).